NASA’s space shuttle program lifts off for the last time this week, with space shuttle Atlantis slated to take off on Friday, July 8. And two iOS apps aim to let you participate in the launch. If you’re looking to follow the shuttle as it orbits the planet en route to the International Space Station on its 12-day mission, GoSoftWorks’s free GoAtlantis app will let you know when to turn your gaze skyward. The universal app will provide real-time tracking of the final space shuttle mission and, using the location capabilities of your iPhone or iPad, predict when the shuttle will pass over you and where you should look. GoSoftWorks released GoAtlantis as a free app to commemorate the last space shuttle mission, but the company has other paid apps in its roster as well. 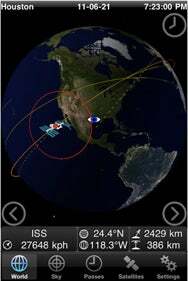 GoSatWatch allows you to track hundreds of satellites currently orbiting in space much in the same way as the GoAtlantis app will do with the shuttle, while GoSkyWatch Planetarium helps you identify stars, planets, constellations, and other celestial bodies simply by pointing your iOS device toward the night sky. Should you happen to be in Florida this week in the vicinity of the Kennedy Space Center, there’s a small mission in which you can participate. Hunter Research & Technology, maker of the Theodolite apps for the iPad and iPhone, has announced its Theodolite Space Shuttle Tracking Project, which aims to track the trajectory of the shuttle using crowd-sourced and geo-stamped photos of its ascent. 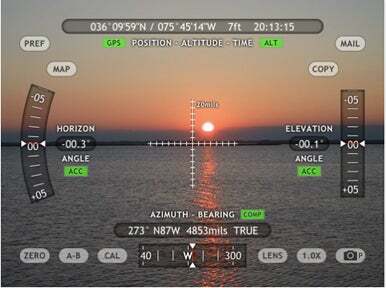 Users of the Theodolite Basic, Theodolite Pro, and Theodolite HD apps can take data-stamped photos of the launch, with the shuttle itself in the crosshairs in the center of the screen, and either post the photos to Hunter Research & Technology’s Facebook wall or send them via email. The free version of the app does not allow the snapping of photos but users can still take a screenshot of the screen in the configuration described above and send it in. The folks at Hunter Research & Technology will collect the photos sent by users and analyze them to determine the trajectory of the shuttle, which will be published about ten days after the launch. The company is also holding a giveaway of five $50 US iTunes gift certificates for participants in the program. These new apps may be specifically aimed at the Atlantis watch, but as we noted back in March in advance of Endeavour’s final launch, there are plenty of other iOS offerings out there to satisfy your thirst for space shuttle news. NASA offers a free app—both for the iPhone and iPad—that includes live streaming from NASA’s public TV channel as well as countdown clocks, photos, and launch information. SpaceGeek also streams NASA TV to your iPhone and iPod touch; in addition, it provides daily images, news feeds, and video updates from the European Space Agency (ESA), Space.com, and Universe Today. Updated 7/6 at 7:52 a.m. PT to correct a vendor’s name.